Rescue Technology has created our privacy statement to show our commitment to the privacy of our visitors and customers. We NEVER pass visitor or customer information to third parties. 1. 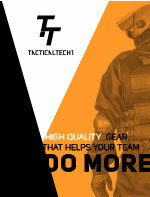 Information Collection: The following discloses our information gathering and dissemination practices for the TacticalTECH1 website: In common with most websites, we use general IP addresses of visitors to help compile aggregate visitor logs for our website. In the case of purchases, your IP address may be used to help identify you and your shopping cart. Our site's registration/mail-list forms require users to give us contact information (name and e-mail address). We may use this contact information to occasionally send them information about our company and products. Users may opt-out of receiving future mailings - see below. Our site uses order forms for customers to acquire information, products and services. We collect customers' contact information (address details) and financial information (like credit card numbers). Contact information taken from order forms is used to send orders and information about our company to customers. The customer's contact information is also used to get in touch with the customer when necessary. Financial information that is collected is only used to bill the user for products and services. Users may opt-out of receiving future mailings - see below. a division of RescueTECH1, Inc.